Sometimes known as the "swamp rattler" or "black snapper", this rattlesnake is one of a group of nine snakes separated by the main group of rattlesnakes because of unique physical characteristics including a group of nine large plates on the crown of the head. This Midwestern rattlesnake ranges from western New York and Pennsylvania to eastern Iowa, north throughout the main body of Michigan and south through mid Illinois, Indiana and Ohio. The ground color is usually gray or brownish gray with irregular white or yellowish markings. Some adults such as the one pictured here, are jet-black with little or no pattern or markings. 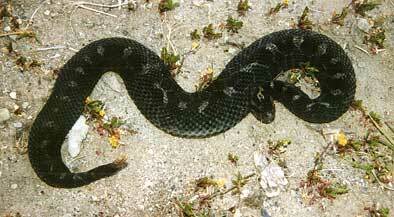 In either case the Eastern Massasauga has a dominantly black underside.